Not only did they win at home (65-59) but they created a sensation by defeating USVO in the second match in Valentines (73-70). This was USVO’s first home defeat in eight years in this competition. From that famous series Elisa Aguila is the only player left for the 2005 Ros Casares team. Everything else has changed including the coaching staff for both teams. In 2008 neither Ros Casares nor USVO have had a smooth ride domestically. 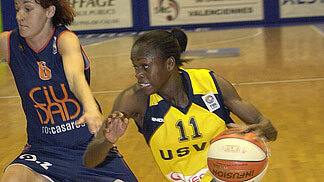 Yet Ros Casares, playing at home, thumped USVO in the first game of the three-match series (70-44). They were hoping to end this series quickly because the Queens Cup begins next weekend and they could have done without an extra mid-week game. Not only did they win (71-63) but they also handed Ros Casares their first defeat in EuroLeague this season. With USVO not having played domestically last weekend they will be ready to challenge Ros Casares for the third and decisive match. In the meantime Ros Casares suffered a setback in their preparation by loosing last weekend to San José (73-71). Now the final game in this EuroLeague championship series has all the ingredients to be explosive. Three years ago Aguila hit back-to-back three-pointers in the final period that tied the game and swung the pendulum in favour of Ros Casares. Who will have the upper hand in the last match of the eighth-final: Ros Casares with Aguila or USVO‘s Laura Koehn, both excellent shooters from beyond the arc? The match was made available online here .